Florida-born Summerall (1867-1955), graduated from West Point in 1892, saw duty on the frontier in last days of the Indian Wars, served in the Spanish-American and Philippine Wars, helped train the newly formed National Guard, saw duty on the Mexican border, commanded brigades, divisions, and corps during World War I, served on the American Peace Commission at Versailles, later headed the Hawaiian Department, testified at the Billy Mitchell court martial, and ended his career as chief-of-staff of the army (1926-1930). In retirement he was for many years Commandant of The Citadel. In the early 1950s Summerall penned this often lively, sometimes contentious, yet completely engaging memoir of his long career. Although free with his opinions, criticisms, and, occassionally, suspicions, Summerall often casts fresh light on past controversies, from the Billy Mitchell case (in which his evidence seems damning) to the now long-forgotten struggle by the army to secure equality in rank for the chief-of-staff of the Army with the Chief of Naval Operations. 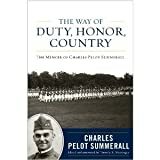 Along the way Summerall gives the reader some terrific anecdotes about army life, service politics, and various persons of note.